‘The Big Easy’ aka New Orleans, popularly known for being the birthplace of jazz, is a haven for music and dance lovers. Most of the best music can be found in The French Quarter of the city. With live music and dancing at almost every corner, there’s just so much to do. Here are a few things to do in New Orleans that’ll have you going back for more. As time progressed, the vibe of New Orleans that emanated from the great music on Bourbon Street got lost. While the fame remains, the best music doesn’t. Most of the good music has moved to Frenchman Street. While some clubs charge a small entry fee, most of them enforce a one drink minimum rule. My picks from spending every evening on Frenchman Street would be Bamboula’s, The Spotted Cat Music Club and d.b.a. You’ll also find your fair share of brass bands and folk musicians playing on the street with no one competing for space. That being said, catch the bands playing at Musical Legends Park on Bourbon Street. Right in the heart of the historic French Quarter is Jackson Square which during the day is teeming with street musicians, palm readers and artists. 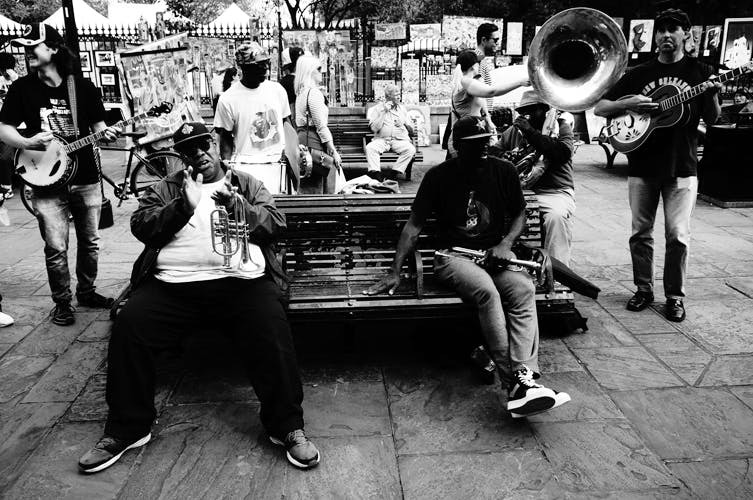 With numerous styles from folk music, contemporary jazz, brass and rap, you’ll find more than enough top-quality music around the park at Jackson Square where you can easily spend all day. If you like what you see and hear, don’t forget to tip the performers. New Orleans brings out the dancer in you, even if you have two left feet. You’ll find couples breaking into serious dance routines at the drop of a hat. Whether it’s a club playing swing music in the afternoon or a music festival, or even a simple brass band playing on the streets at midnight, you can be assured there will be dancing. This isn’t limited to a few clubs, but anywhere in the city where there is music. Feel free to join in. You should definitely check out Maison, Mimi’s in the Marigny and the Blue Nile for an awesome dance experience. The Louisiana Music Factory on Frenchman Street is a must-go for any music lover. Keeping the tradition of the old-school music stores alive, the folks at the place can help you discover some of the fabulous music that defined the history and present of New Orleans. Don’t forget to check out the $3 vinyl boxes which have an overwhelming collection of jazz, rock, blues and many more genres. New Orleans allows you to drink on the streets, as long as you use a plastic cup. So while checking out all the music, do have some of the fabulous local beers and cocktails give you company. Beer enthusiasts will have a plethora of choices when it comes to craft beer, so feel free to experiment. My pick is the Amber and Purple Haze, both from Abita breweries. Don’t miss out on picking up Hurricanes from the local stores, a strong cold cocktail guaranteed to light up your day. When it comes to food, don’t miss out on the food trucks that offer you way more options than your brain can process. My ritual to end every evening was to grab a bag of beignets from Cafe Du Monde that’s open 24 hours.